Memorials of the Powells of Nanteos Mansion. 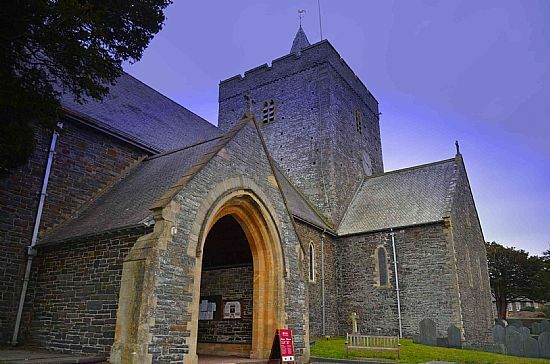 St. Padarn's church, Llanbadarn Fawr, Aberystwyth. 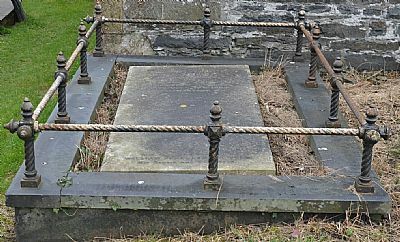 The Powell Family of Nanteos are buried in Llanbadarn Fawr Church. 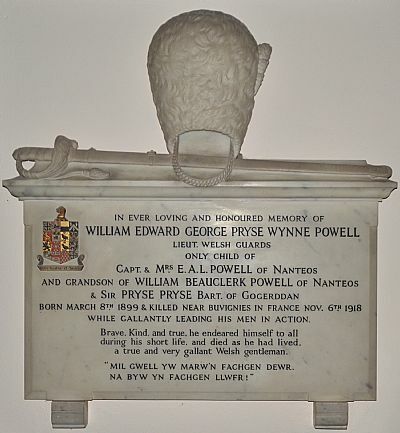 The Powells of Nanteos, were landed gentry of Cardiganshire owning a vast acreage of land in the area. 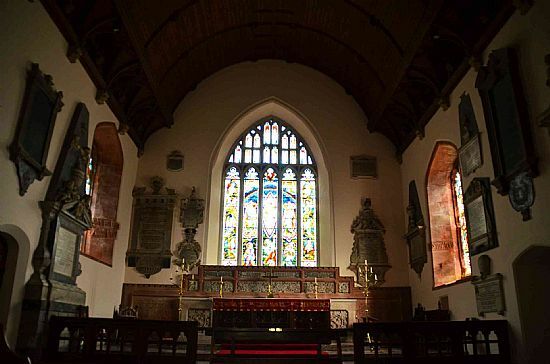 Some are commemorated in the stain glass windows around the alter of the church. Cornelius Powell who died 3rd July 1864, aged 46. 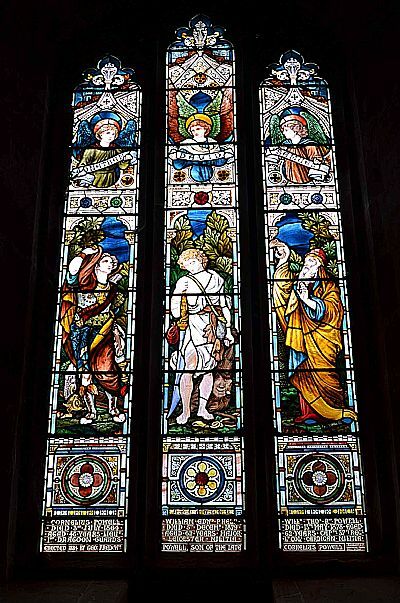 Erected 1884 by George Frederick William Powell. Son of the late Cornelius Powell. 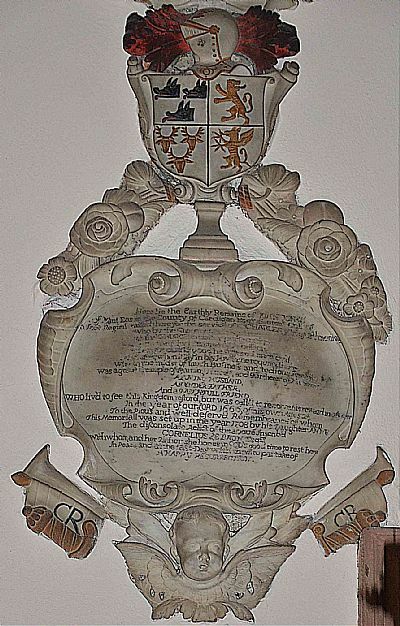 The first Memorial Stone illustrated below is of Colonel John Jones, who raised the Cardiganshire Militia in support of King Charles I during the Civil War, he was the earliest known inhabitant of the Nanteos estate. He had three daughters, Mary, Anne and Elinor. 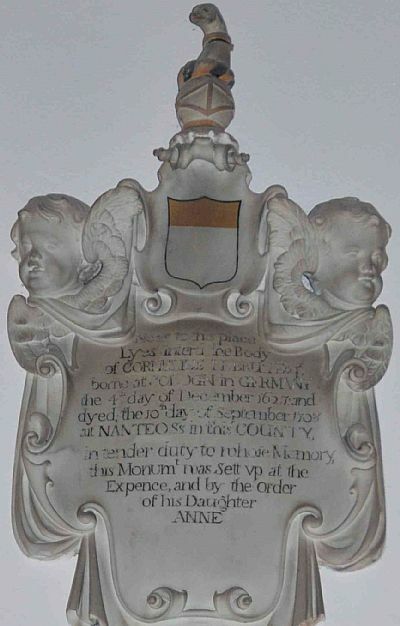 Anne succeeded on her father’s death in 1666.
at NANTEOS in this COUNTY. I mourn an illustrious gentleman of most happy memory, cultivated in every aspect of knowledge; [since] you ask, traveller, here he lies. 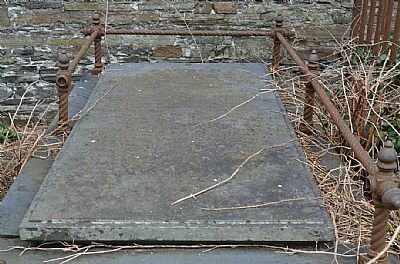 Here rest the shades, undoubtedly venerable, of Thomas Powell, Knight, once a highly respected attorney, then of the North Wales circuit and at Ludlow an honoured judge, afterwards Baron of the Exchequer and a judge of the King’s Bench, administering the law of William III, first after the chief justice of England; who when conscience forbade him to comply with the state’s change of circumstance, spent sixteen years of his remaining life in alleviating the poor and the oppressed with free counsel; or if [i.e. in the case of] a citizen of his own office, he gave advice eminently useful to the public. 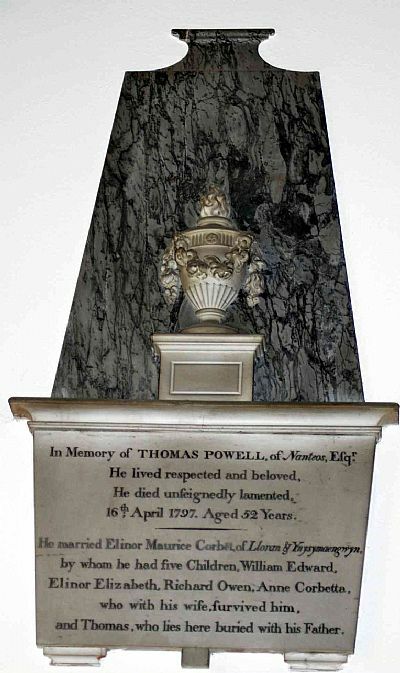 He died on 22 January A. D. 1704/5, aged 73, long afflicted by illness, which he bore nevertheless with a marvellous constancy of spirit, preserving equanimity even in the grip of death. So to a very dear father in respect. 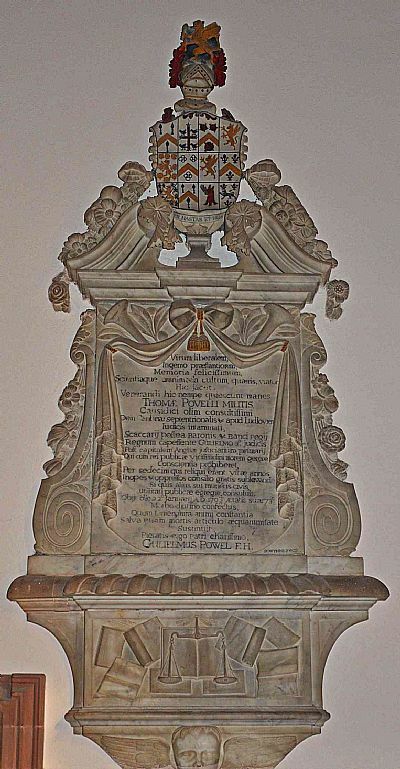 William Powell made this [monument]. Sir Thomas Powell lived in Llechwedd Dyrus across the Paith steam from Nanteos. His son William married Avarina Le Brun of Nanteos, daughter of Cornelius Le Brun, in 1699. This is point in history where the Powell family began their long establishment at Nanteos. Parents, Friends, and were re-markabIy. Brecon Esq. by the above mentioned Eliz. 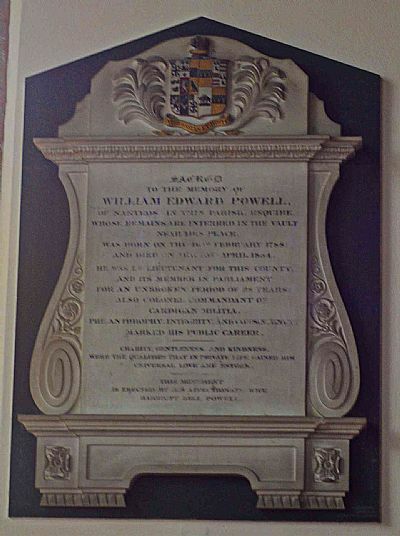 William Edward Powell died at Nanteos, and this menorial tablet was erected by his 2nd wife, Harriet Dell Powell. 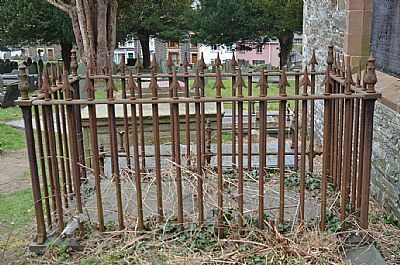 Sacred to the memory of Richard Owen Powell, Esq., who departed this life on the 4th June 1859, aged 65 years. 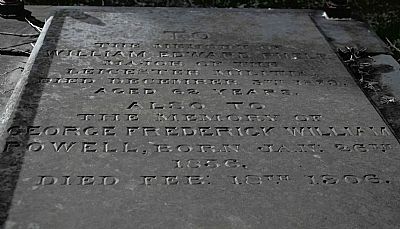 Also Athelstan Owen Powell, eldest son of the above Richard Owen Powell, died at Llwynhiriaeth, Cemmaes, Montgomeryshire, 29th of April 1874, aged 43 years. 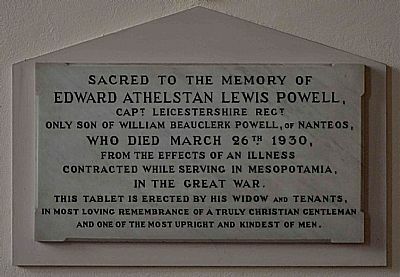 Also Elinor Harriet Powell, eldest daughter of the above Athelstan Owen Powell. Born September 8th 1864; died November 1st 1889. Buried at Ilford Cemetery, near London. 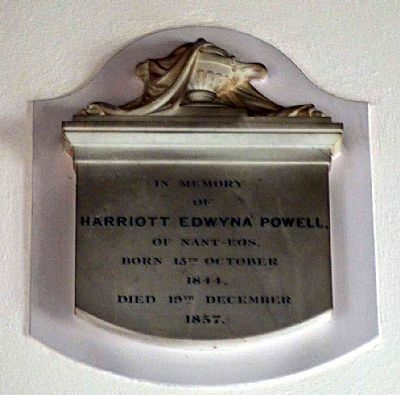 Harriott Edwyna Powell dies at Nanteos in 1857 of comsumption. 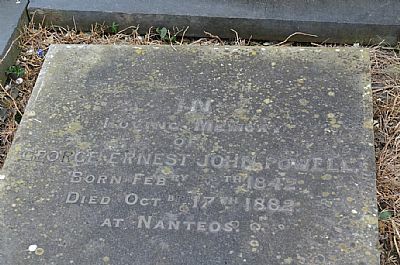 George Ernest John Powell died at Nanteos. Rosa Edwyna his mother & Harriet his sister are also buried here. 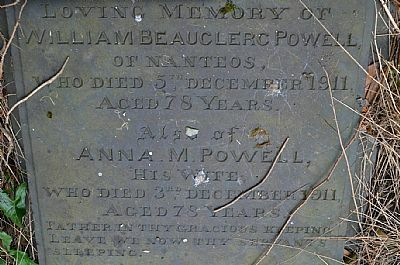 William Beauclerc Powell and his wife Anna Maria Powell died at Nanteos within two days of each other. 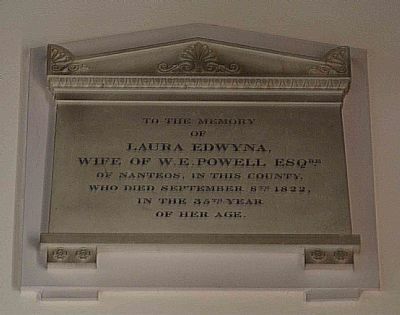 Edward Athelstan Lewis Powell & Margaret Lousia Joan (Pryse) Powell are also buried here, sadly no funding was available to inscribe the memorial stone.